So CNBC came out with an article today saying that Morgan Stanley estimates that Amazon Air is presently taking about 2 percent of the FedEx and UPS air parcel revenue away. My favorite lines: "Morgan Stanley believes Amazon Air represents 2 percent of potential revenue lost for UPS and FedEx this year. The firm sees that revenue loss accelerating to more than 10 percent by 2025. "We expect this drag to intensify once Amazon Air has all 40 planes in the air (and potentially 100 planes if it runs its planned air hub at capacity) and as its utilization improves to UPS/FedEx levels," Shanker said." Wait. What? WHEN they have all 40 planes in the air???? You mean in September 2018? (The last plane came on in November, but, counting spares used by Atlas, there were basically 20 available at Atlas as of September 2018. ATSG put its last of 20 online in mid-2017.) And one additional aircraft isn't going to cause "drag to intensify". This is what passes for financial analysis these days. At a premier firm. Yikes. So chances are this is a big wild-a$$ guess. However, it is an interesting perspective. One would note that to be 2 percent of parcel revenue, it has to be a much bigger slice of parcel volume, given the highly-discounted rates at which Amazon parcels move on UPS and FedEx. Reading that article, I figured the 'future tense' was a matter of financial reports. Morgan Stanley is doing market analysis of FedEx and UPS based on 3Q results. In the 3Q, there were still at least three aircraft to be delivered. Looking forward to 4Q results, MS predicts that UPS and FedEx revenues to be impacted even more "once Amazon Air has all 40 planes in the air". As you pointed out, they're in the air now, and we'll have to wait and see how 4Q results are affected (if there's even an accurate way to measure the impact Amazon Air has on UPS and FedEx). I think it was just financial-specific writing, not botched market awareness. Who knows what to believe anymore. In Oct of 2017 Bloomberg puts the revenue at UPS in the 5 to 10% range. Remember they do a lot of ground, too. This was only about Amazon Air. N373AA will be going to ATI and entering service soon. It will be flying a UPS route but it wasn’t specified which one. In an interesting twist, because of delays with conformity and certification, the plane will operate for the foreseeable future in the scrubbed down AA livery. UPS wants the airplane now, so there’s no time to send it to paint. That should provide some interesting spotting opportunities. Also, does anyone know anything about N382CM? It was mentioned that this will be the next plane destined to ATI, but I can’t figure out if that’s a separate plane or a re-registration of N373AA once it comes out of paint. Thanks! 382CM will be the new number for 930WE. Never mind, I answered my own question. It appears N382CM is the former N930WE. I don’t have any intel yet on what the plans for that aircraft will be, but rumors have been swirling of Europe, China and Australia flying in the works, so we will see. You must have answered while I was typing. I should have just waited, I knew someone would have an answer. Thanks, WJ! They must have anticipated 373 going right into service, because someone at TLV painted over the green with some almost matching grey. So it doesn't have the scary, about-to-fall-apart look that usually characterizes CAM's TLV conversions. Until they go through a full strip and paint at Dean Baldwin. I guess that’s not as exciting/Frankenstein-ish though it will be something different for a bit. I’m sure some will comment on it if they see it from a terminal or roadway. Welcome to ACMI. That's certainly what I was thinking (hoping for?) when you mentioned the washed-down AA livery. Keepin' it classy. Ha yes that’s more of what I had in mind. Though I did see a picture so I knew it wasn’t so bad, but it was from the right side so I wasn’t sure what the door area looked like. Thanks again for the info! I just realized that what's so perfect about Yochai's photo of 377AN is the weed(s) right there in the foreground. Really sets the tone for the image of the aircraft. Looks abandoned. The first picture reminds me of the neighbors car that had a wreck and he put the bondo on it but never quite got around to finishing it. Does anyone know when it stopped flying for ABX and was stored @ILN? As of September of last year it had 61000 hours and 44000 cycles. Still a few good years left in her. Huh. Still no pending number change or indication of export. But the records often trail reality. Guess it wanted to hang around the US a little longer. 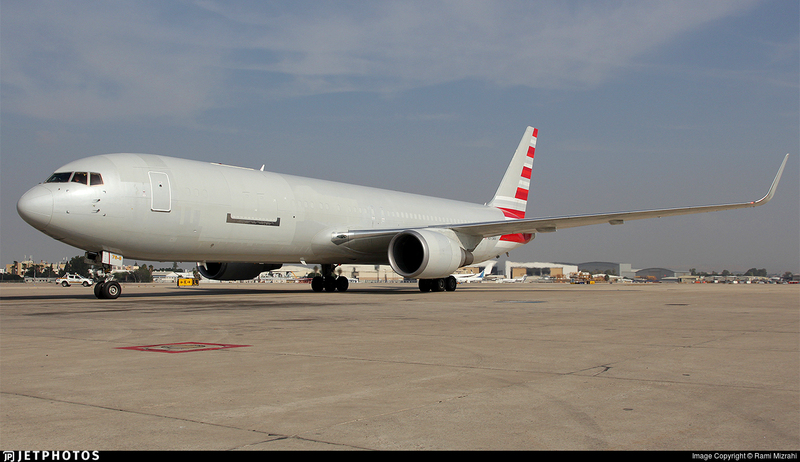 N1487A is the final Altas/Titan/Andromeda 767-300 conversion relating to the Amazon assignment. It has been at TLV since 12/5/18. It did a 2.5-hour test flight on Saturday 10/6/18, so seems to be getting close to completion. Also on Saturday, 10/6/18, IAI/Bedek/MexicanaMRO completed conversion of N765CK, Connie's latest 767-300 conversion (and the 4th one completed on the MexicanaMRO line). The MexicanaMRO shop, seems to be getting faster with every conversion. The initial conversion for Connie took a typical amount of time. The second one was 4.5 months. The third was 4.25 months. This one took 3.66 months. Obviously, things like backlog and condition of airframe, etc., enter into it, but it is interesting to see that the MexicanaMRO line (which can only put one 767-300 in the hangar at a time) seems to be working hard and getting better at accomplishing the IAI/Bedek conversion. They also might be able to put more worker on it or staff around the clock shifts. The pay scale in Mexico is way less than Israel or Germany. Skyliner reports Connie got another conversion this week, LN 568 registered 739DH. Is this really his 9th 763? Dunno, but looking at the flight log, it leveled off at 29000 feet. Looks like they made the decision to turn around right after that (that's the dip in airspeed). Bets are something broke, try again later! Looks like it's on the way again tonight, 9/7/18. Has made it a little further as of this writing. Regarding Peak flying, N373AA is making its initial flight right now from ILN-SDF. N376AN did it's last UPS South American flight yesterday (MIA-BOG-MIA), and has ferried to PHX to start UPS work tonight. Wow keep em moving! Good for the company. And both put immediately to work: 373 quickly loaded and headed for PDX; 376 turned around and headed from PHX-SDF. Whereas these UPS flights seem sometimes to use UPS flight numbers (the MIA-BOG business, for example, or some Western Global flights), these are running under the ATN callsign. And 255CM (a 767-200) should be heading to SBD tonight to start more UPS service out there. As Acey pointed out in an earlier post, 373AA took long enough in conversion that UPS needed it before it could be painted properly at ATSG's usual painting contractor. So IAI sprayed some grey over the areas with exposed primer, and it doesn't look too awful. However,it might be a fun spotting opportunity in PDX and wherever else it flies. On the ABX side, N364CM (767-300) ferried to MKE earlier today and is now in service on UPS, heading to SDF. And just to round out the interesting Peak flying, our friends at Amerijet have been flying a 767-300 from MEM to Latin America (BOG, etc.) for about 2 weeks under an FDX callsign. Looks like they will be starting another 767-300 doing domestic stuff (ABQ-MEM, I think) tonight. Last edited by wjcandee on Tue Dec 11, 2018 2:56 am, edited 1 time in total. Sounds about right for the lack of call sign change. The 21 Air 762s that have been flying the past few weeks for UPS have kept their CSB flight numbers too. Maybe they just don’t assign UPS numbers for short term leases. Another thing that occurs to me: The wet-leasing airline's callsign on international flights but not necessary on domestic? Perhaps a combination of all that. The CSB flights have all been Florida to SDF and PHL since around thanksgiving though, and while Florida seems like a completely different planet at times, I think it’s still part of the us since 1865. One of those aircraft was doing South American runs before that though. I love seeing those geriatric 762s getting some good use. Are some of these South American cargo runs to pick up work from the suddenly retired Canadian DC-10s? For UPS, any of the subcontractors will use their own callsign(WGN, CSB, GTI, KYE, ATN, etc), but the flight number is usually a UPS number(ex. if flown by UPS it's UPS752, then WGN would file as WGN752). For FDX, it appears that each year their contractors somehow get to operate under the FDX callsign... which surprises me since my understanding of the various regulations required the the pilots and aircraft to be directly under the operating carriers certificate. No clue how they get around that. Oh and also today, there was a KFS734 on the ramp here at SDF. Quick question: one of the Amazon leased ATI 762s (N255cm) is currently en route CVG-SBD as ATN9769. How come? Good catch. The answer is that 255CM isn't an Amazon lease. It's an ATI spare. The 6th 767 - 200 on the ATI Amazon dry lease list is 739ax. That was an Amerijet lease return that took freaking forever to make it through maintenance because there was so much wrong with it. And it needed an aft bulkhead replacement. So they put 255cm in for a period of time until that aircraft finally became available. Once they did that, 255 became available as a maintenance spare and for military, etc. It leads a somewhat nomadic existence. The Amazon dry leased aircraft can't be used for anything other than Amazon. But because 255 is not an Amazon dry lease, it can be used for UPS during Peak. Which is why I it deadheaded out there today. FWIW, the Amazon dry-leased 767-200s at ATI are: 739AX, 714AX, 791AX, 761CX, 762CX and 763CX. At ABX, they are, I believe: 744AX (currently in HMV), 749AX, 750AX, 774AX, 795AX, 768AX. Recently used to cover maintenance needs are 767AX and 740AX, as well as 312AA. All those are also used on other ABX Air routes. 312AA has been doing a bunch of military recently, for example. For UPS, any of the subcontractors will use their own callsign(WGN, CSB, GTI, KYE, ATN, etc), but the flight number is usually a UPS number(ex. if flown by UPS it's UPS752, then WGN would file as WGN752). What raised the question is the fact that when flying MIA-BOG-MIA, ATI used a UPS callsign the past two weeks or so. And Amerijet has been using a FedEx callsign when flying to Latin America the last two weeks. Hence my thought that, possibly for international conventions and/or rights purposes, the contractor uses the main airline callsign when flying abroad. For what it's worth, it is common (at least it used to be) for subservice operators to use the callsign of the hiring carrier; don't know how that applies here. And I missed 797AX deadheading to McAllen, Texas, then starting tonight to SDF. So, ABX has a 767-300 and a 767-200 flying for UPS. ATI has two 767-300s and a 767-200 flying for UPS. This is more than was originally disclosed publicly. You got to enjoy peaking flying. Here in MSP we are getting everything from a 737-400F 730CK (UPS?) and Amazon Prime, N1217A 364CM, Atlas Air 767-300 even a 747-800 for UPS. (SDF-MSP-ANC) Make that money now. Going further off topic, it looks like the 21 Air 762s have each picked up a Florida-DFW rotation this morning after returning from the PHL last night. It will fly SBD-CAE-PDX-SBD until about mid-January if I remember correctly. Indeed, she's up as ABX 2474 CAE-PDX. Looks like around 12 hours total airborne today, getting a workout. Slightly off topic but does anyone have a list of leased in aircraft for Peak for both UPS and FEDEX? You have our list above for the ATSG carriers and Amerijet. I think KYE has a 747 running for them, 21 Air obviously, GTI, Kalitta, maybe Cargojet, maybe more WGN than usual, Kalitta Charters II. You kind of have to go to Planespotters and then just go through the fleet and see what the routes are, bearing in mind that many routes will not be to MEM or SDF but still be for UPS and FedEx.